The RAN Armament Depot (RANAD) Newington was located at Newington, New South Wales, Australia, within the Sydney metropolitan area. It lay on the south bank of the Parramatta River. Approximately half remains, now decommissioned, and is known as the Newington Armory, a part of the Sydney Olympic Park. 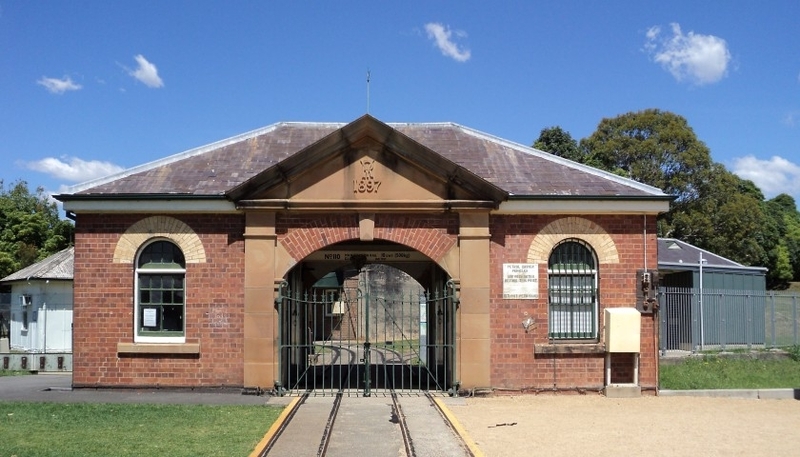 Initially a powder magazine erected for the Military Forces of the Colony of New South Wales, it later became a Royal Australian Navy armament depot. A summary history of the Newington Armory can be found on Sydney Olympic Park Authority's website. For a more detailed exploration of the history, follow the links below. Newington's history encompassed a period of 124 years between 1875 and 1999 when the depot closed. Approximately half survives as the section of Sydney Olympic Park known as The Armory. This page will give you an overview of those 124 years. RAN Armament Depot Newington - Chronology. All of the buildings constructed at Newington in 1897-98 survive, with the single exception of the guncotton magazine. View a photo album showing these surviving buildings. First-hand accounts of activities at the Newington Magazine during the occupancy of the military (i.e. 1897 to 1921) are hard to come by. In their absence, however, it is possible to infer what happened there from other sources of evidence. The major activities of the NSW Military Forces in 1897 were the coastal defences of Sydney, both artillery and submarine mines, and the militia forces (infantry, mounted, etc) who were quite widely dispersed throughout the colony. The Military Magazine at Newington. "In 1921 management of the Depot was transferred from the Royal Marine Garrison to the Royal Australian Navy.". A Google search produces about 14 references similar to the above; all are incorrect and have probably resulted from uncritical copying from a single source. The foundation of the depot. "Laboratory: - the block of buildings (with the passages and ways leading thereto) in which the examination of all ammunition will take place, cartridges made up, and shells filled." "The building consists of three wide barrel-vaulted store rooms and a triple gabled slate roof. Similar character to the other early buildings: face brick, cream brick trims, sandstone capped gable ends with round vents. The vaults have double walls with a passage in the wall cavity and windows so that lanterns could be placed in the passage to light the vaults." When the ex-Royal Australian Navy Armament Depot at Newington was incorporated into Sydney Olympic Park it was renamed "Newington Armory"; an unhistorical title but understandable from a marketing perspective. Much information about the history of Newington and other explosives storages around Sydney Harbour can be found in the files of Sydney newspapers. A scribe (to use his own description) from the Cumberland Argus and Fruitgrower's Advocate was on the scene as building got under way in 1897. The reporter's story about the erection of the first buildings at Newington powder magazine. At the time (1897-1898) that the Military Magazine was constructed at Newington, it was common for some staff to live on site. In that era personal transport was not available to most, and the establishments were often in remote locations. Having staff close by meant that out of hours business was made easier, and that people were available to deal with emergencies that might arise. June Madden's father was Stan Atherton, the Officer-in-charge of RANAD Newington between 1950 and 1962. As a young woman, June lived in her father's residence at Newington. View June's album of photos taken there. "IN MEMORIAM. We record with regret the passing of Doll, the retired Newington Depot horse. Rather than sell the old girl after many years of faithful service, Doll was pensioned off to graze the area and she enjoyed five quiet years." "From the wharf, on which the iron gates will form the main entrance, there will be a thorough system of tram lines running around the reserve. One line will run to the gun-cotton store on the right hand side, and a double line of rails will run to the powder magazine." "In March 1920, shortly before the Newington magazine was taken over by the RAN, the wharf was equipped with a small, hand-worked travelling crane with a capacity of 3-hundredweight." Building 39 at RANAD Newington (now known as the Armory) contains a display of inert explosive ordnance, most of which have some association with the site. View the field guide to the Newington Armory explosive ordnance display. Information about accidents involving explosives that took place at Newington. With the RN Eastern Fleet base in Ceylon under threat, the Admiralty decided to relocate the gun and ammunition reserves for the Fleet to Australia, and these were soon on the water. Take a mid-20th century photographic tour through this depot. Material on this page may be copied for personal use. If you intend to republish any substantial part of the page in any manner, please acknowledge the source and provide the URL of the page.